Faster than Fast Ethernet. More powerful than a Pentium III. Able to leap a minitower in a single bound. 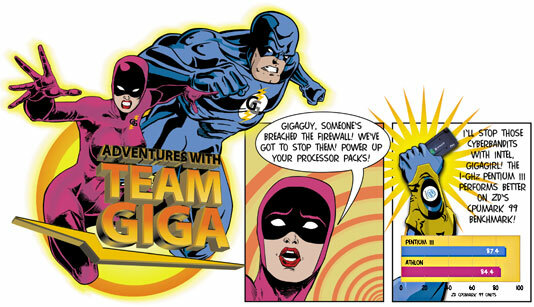 TeamGiga stands for truth, justice and systems administrators who want superfast processors and high-bandwidth communications. This week, we meet our heroes deep in the GigaLair, ready to do battle against Web-hacking cyberbandits. Which gigahertz processor will TeamGiga choose? Read on. And don't miss the continuing saga next week, when TeamGiga must decide between fiber and copper gigabit networking. Don't expect a big knockdown in the battle of the 1-GHz processors. The Intel Pentium III and the AMD Athlon both are lickety-split fast. 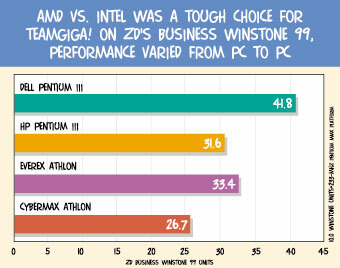 In GCN Lab tests, Intel's Pentium III edged out the Athlon from Advanced Micro Devices Inc. of Sunnyvale, Calif. But the slight difference'about 3.5 percent on bench-mark scores'might not have come from the processors. The lab asked computer makers to provide samples of current 1-GHz desktop PCs. At the time of our request, few companies had received any shipments of 1-GHz processors. AMD and Intel had just begun production of their top-of-the-line chips. GCN received some systems with the only 1-GHz processors their makers had on hand. At the time of writing this review, only two of the four units we examined were available for open-market purchase. The lab tested two Athlon and two Pentium III systems. We ran numerous benchmarks and took the PCs apart to examine them closely. The CPUmark 99 test in the Ziff-Davis Business Operation benchmark suite shows the performance of the processor and Level 1 and Level 2 caches and, if it overflows, the main RAM connected via the front-side bus. Consistently in every test, the Intel systems from Dell Computer Corp. and Hewlett-Packard Co. scored a bit better. The Athlon Explora system from Everex Systems Inc. scored on par with the Pentium III systems. The other AMD system, from CyberMax Computer Inc., scored lower, bringing down the overall Athlon average. Processor design as well as motherboard and chip set enhancements made subtle differences that pushed the Pentium III out in front of the Athlon. Both processor cores operate at 1 GHz. Just outside the core, the Level 1 cache acts as a staging area or waiting room, where code is organized before entering the core for execution. AMD builds in 128K of L1 cache, Intel only 32K. The more spacious AMD cache gives Athlon systems a leg up on some floating-point calculations. ZD's WinMark floating-point-unit test focuses on the processor and L1 cache, and the AMD systems showed stronger performance on that particular benchmark: 3.7 percent better. The Athlon Level 2 cache lost ground, however. Think of L2 cache as a much larger waiting room for the L1 cache. Both processors integrate the L1 cache on the same silicon wafer as the processor. The Athlon's L2 cache is on a separate silicon die, although it's integrated into the processor module. The 512K cache operates at a third of the processor's clock speed'about 333 MHz. Here's where the Pentium III rocks and begins to take over the lead. Intel puts 256K of L2 cache on the same wafer as the L1 cache and processor. That means the Pentium III's L2 cache operates at the same 1 GHz as the L1 cache and processor core. It occupies half as much space, but it dishes out the information much faster. Outside the processors and their caches, more subtle differences appear. AMD's faster front-side bus, which connects the L2 cache with the main RAM, transfers at a rate of 200 MHz compared with Intel's 133 MHz. The Intel-based PCs use the Intel 820 chip set and Rambus dynamic RAM, called RDRAM, which operates at up to 800 MHz, in contrast with the Athlon's 100-MHz synchronous dynamic RAM. The Intel 133-MHz bus moves data between the L2 cache and RAM 67 MHz more slowly than the AMD's 200-MHz bus arrangement. Two school buses pick up kids every morning. Intel's school buses are slower, but the kids get on and off the bus faster. AMD moves the kids faster, but they get on and off much more slowly. Overall, the bus and RAM speed differences tend to cancel out one another. When processors start clocking 1.5 GHz and beyond, RDRAM will begin to show up as more of an advantage. RDRAM currently costs about 30 percent more than standard RAM. The Dell system we tested had 800-MHz RDRAM; the HP workstation had 700-MHz RDRAM. The 100-MHz disparity resulted in a 1 percent higher CPUmark result for the Dell unit. Other factors that made for performance differences among the four 1-GHz machines had nothing to do with motherboard design or gigahertz rates. We suspect that better heat management gave the Intel systems a slim advantage. Both Pentium III PCs had a large fan inside the chassis that propelled air from outside along the heat sink via plastic ducts. The Athlon units each had a heat sink with two small fans that drew air from within the chassis, where components tend to be warmer than room temperature. Heat, L1 and L2 cache, front-side bus and memory all contribute to the differences we measured in processor performance. But ultimately, the overall system performance depends on how well the internal components mesh together. The operating system, hard drive and graphics adapter also influence benchmark results. Just look at the results from ZD's Business Winstone 99 benchmark, which tests performance with the three top office suites. The Intel-based Dell Dimension performed best; the AMD-based Everex came in a distant second. Although we asked for Windows 2000 Professional on all systems, only the Intel systems had it. The Athlon systems came with Windows 98. The Ziff-Davis CPUmark and FPU WinMark benchmarks have shown little performance difference between the two OSes in our experience. But ZD's Business Winstone 99 revealed substantially better performance for the Win 2000 systems. Other benchmarks had variable top scores. For example, the HP Kayak workstation performed best on ZD's Content Creation 2000 test, which runs several multimedia authoring tools. Although the Dell Dimension earned most of the top benchmark scores, its Reviewer's Choice designation stems largely from the excellent components in the chassis. We liked the other three systems, too, for different reasons, but neither HP nor Everex yet sells a 1-GHz system, which knocks them out of the running. As for CyberMax, we liked its chassis very much, but on the benchmark tests it scored in fourth place every time. Dell's 1-GHz Dimension currently is not on government contracts or the General Services Administration Information Technology Schedule, but open-market buyers should seriously consider this monster system. So much power is expensive. The Dimension XPS B we examined was $2,869 without a monitor. All four systems had Accelerated Graphics Port X4 cards; AGP buses can transfer more than 1 Gbps. The Dimension's AGP card incorporates 64M of double-data-rate synchronous dynamic RAM. DDR memory means that data is transferred in and out of the memory at the same time and at the same clock speed'in this case, memory operating at 150 MHz. That effectively doubles memory performance, meaning that the 150-MHz DDR SDRAM does as well as regular SDRAM at 300 MHz. The Dell's 128-bit GeForce Plus 256 adapter from nVidia Corp. of Santa Clara, Calif., includes both a 15-pin analog VGA port and a new Digital Video Interface port. Digital signals created within a PC currently must be converted to analog signals by the graphics adapter, but over the next few years, 15-pin VGA plugs will be phased out. DVI is the prevailing standard. The Dimension's video rocks. You'd be hard-pressed to find another desktop system with a better video card. The 30G hard drive spins at 7,200 rpm and transfers data at 66 megabytes/sec. That's generally tops without going to SCSI storage. Dell built in both a DVD-ROM drive and a CD-recordable/rewritable drive as well as a modem, a network interface and high-quality sound cards. The chassis cover was removable without tools, although it did take a little prying. The spacious interior was easy to get around. All cables were bundled and out of the way for accessing RAM, bays and PCI card slots. The Dimension lacked ISA slots for legacy cards, but nowadays that shouldn't be much of a problem. Overall, Dell's system was extremely powerful, with first-class components. The other gigahertz system we examined that's now available for purchase was CyberMax Computer's Enthusiast 4 K7-1000, which costs $2,300 without a monitor'almost $600 less than the Dell. Although the Athlon processor is a little cheaper than a Pentium III, the CyberMax video card is only half as beefy as the Dell's. The 128-bit nVidia GeForce 256 has 32M of standard SDRAM operating at 150 MHz. It supports DVI. The CyberMax unit's 40G hard drive spins at 7,200 rpm and transfers 66 megabytes/sec. Like the Dimension, the CyberMax had both DVD and CD-R/RW drives as well as a modem, a network card and a high-end sound card. We particularly liked the shape and design of the chassis. Although it required a tool to remove the two screws, the interior was clean and well-organized. All interior components were easily accessible, with cables and wires bundled out of the way. The CyberMax's motherboard had a single ISA slot'handy for any legacy cards still in use. The processor was directly beneath the power unit'the warmest component inside a PC chassis other than the processor itself. This unfortunate positioning might be a significant cause of its slower performance on all benchmarks. Like Dell, CyberMax lets users configure and purchase an Enthusiast 4 K7-1000 online. We found the site well-organized. For the budget-conscious power user, an Enthusiast system might be just the ticket. That's why we gave the CyberMax the lab's Bang for the Buck designation. The other two systems were not available for purchase. Both Everex and HP provided us with 1-GHz prototypes exclusively for this review. It's been a while since Everex has sent us a system, and we were pleased to see the Explora chassis design, although the side panel required a screwdriver to open. The interior was orderly, but the RAM slots proved difficult to access because of cables, wires and an occupied bay. The power unit was fairly close to the processor. We think better cooling might slightly improve the scores. Everex provided a 128-bit video card, the Vanta 16 from Aztech Systems Ltd. of Singapore, that had 16M of SDRAM. Although AGP X4 specifies a 1-Gbps transfer rate, the Vanta 16 delivered 900 Mbps and did not support DVI. The Everex unit had DVD and CD-R/RW drives, a sound card and a modem. HP put its prototype submission inside a Kayak minitower. The workstation platform could have provided a strong foundation for performance. Unfortunately, the Kayak's hard drive configuration hurt it on many benchmarks. The first 2G of the 30G drive was formatted for a 16-bit File Allocation Table, and the remaining 28G was unformatted. Generally, FAT16 and smaller hard drives access data more slowly than FAT32. To load all benchmarks, we did format the unused portion of the hard drive to the NT File System. That improved performance somewhat. The HP unit's GLoria II graphics adapter from Elsa Inc. of San Jose, Calif., had 32M of standard SDRAM. 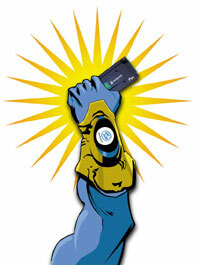 The 128-bit card did not support DVI. Sound was integrated on the motherboard, leaving four of the five PCI slots available. No ISA slots were present. Today's top processors might clock 1 GHz, but there's a lot more to building a fast system than a fast CPU. As Intel and AMD roar onward into the gigahertz world, the two chip makers can learn from each other. Focusing too much on the L1 or L2 cache and not on both diminishes the CPU performance. And fast bus speed does not always guarantee overall speed. What good is a rocking CPU when other PC components slow things down? GCN Lab assistant Arthur Moser contributed to this review.